Home Tags Posts tagged with "ukraine"
In February and March of 2014, the Crimean Crisis triggered international attention to the making of new geopolitical borders. As mainland Ukraine prepared for integration into the European Union, the Crimean peninsula—comprised of an ethno-linguistically Russian majority—slipped further into the tide of a separatist movement intended to unite Crimea with Russia. What ensued was a deft campaign of subtle aggression fought between the two countries, ultimately ending in Russian military intervention and successful capture of the peninsula. Crimea is currently under control of the Russian state, although the Ukraine considers this territorial dislocation to be temporary. So, geopolitically speaking, what is Crimea? Well, as shown by Google Maps, Crimea is what is referred to as a disputed territory. Okay, but how exactly does Google represent the border between Ukraine and Crimea? If Google’s mapping service were to universally mark the border in favor of either of the involved countries’ objectives, the company would face political—and perhaps on an even greater scale, social—backlash. Google avoids becoming politically biased by abiding to the local laws and politics of the host government. In other words, Google Maps in the United States and Google Maps in the Ukraine publish different maps of the border between the Ukraine and Crimea than Google Russia does. Google may be performing its best practice strategy by avoiding a circumstance wherein the company would polarize itself from any major fraction of its consumer population. However, with many imminent and currently unfolding territorial disputes throughout the world, Google’s choice to define borders differently in different maps may start to get messy. There are clear limits to Google’s approach. For example, how does (or could) Google even manage the tangled web of territorial claims in the South China Sea? China, Vietnam, the Philippines, Brunei, and Indonesia all claim some of the same islands…and with China’s claim being based on a historic assertion defined by the 9-dashed line and not the 200-mile EEZ defined in the UN Convention on the Law of the Sea, Google is really in a bind. The South China Sea viewed from the Google Maps in the United States shows no indication of which countries control the highly disputed Paracel and Spratley islands, and this illustrates an important decision that Google made when developing its maps. Perhaps the ultimate limit to Google’s mapping strategy is manifest in the recently announced fanatical Islamic State abridging parts of Syria and Iraq. Established by IS, a religious extremist group claiming to have a formidable government and military, the Islamic State defies the existing borders of Iraq and Syria. As of now, Google does not recognize the Islamic State in its maps, and this is a conscious and political decision tailored to the present. Yet as abhorrent as the premise for the Islamic State is, there is the possibility that it could still exist, for example, three years from now. It is not clear what criteria Google would, or could, use to handle this situation. Put another way, at what point does a “non-state” become a “state” on Google’s maps? Google will have to decide whether to recognize what could materialize as a political reality, or simply ignore the matter as the company does in the case of the South China Sea. And what about effect Google’s strategy has on third party users? What is an American to believe when viewing maps of the Crimean peninsula from their respective version of Google Maps? How would he or she know that territorial disputes exist in the South China Sea or the Middle East when viewing Google Maps without any prior knowledge? Even without explicit intent to do so, Google’s depiction of borders influences the perceptions and understanding of third-party users throughout the world. As a globally referenced data source, Google’s maps thus can at minimum induce confusion, and taken further, could result in misinformed decision-making by parties that rely on these maps. Herein lies Google’s profound ability to shape peoples’ social and political awareness of the world. So, Google has applied a creative approach to document border disputes on their maps in some well-known, and well-understood, situations. But that technique only goes so far, and offers no solution for borders subject to multiple disputes, or for situations where non-state actors appear to be successfully carving out states of their own. Moreover, because Google chooses to address some territorial disputes and ignore others, there is a degree to which Google’s approach is less transparent for viewers from third party states. The question really becomes how does Google decide when to show a disputed border and when to simply ignore the situation. The answer to this question is unclear, and yet has increasingly greater consequences as Google grows as the provider of choice for global digital maps. But one thing is clear: Google is probably never going to be able to please all of the people all of the time. Since November of last year, mounting tensions within Ukraine have made divisions between Russia, the European Union (EU), and the United States (US) increasingly evident. In an effort to establish stronger trade relations with Western Europe, Ukraine’s then-President Viktor Yanukovych initially sought to broker a deal in which his country would join the EU. However, come decision time and ongoing pressure from Moscow, Yanukovych backed out of the EU deal in favor of strengthening economic and political ties with his country’s border neighbor Russia, resulting in the rapid escalation of tensions between pro-Western Ukrainians and eastern pro-Russian Ukrainians. Consequently, pro-Western Ukrainians voiced their frustrations and ousted Yanukovych, while pro-Russian Ukrainians retaliated by seizing government buildings and showing their support for Russian military assistance. Despite the existence of East versus West divisions within Ukraine prior to the controversy surrounding the failed EU deal, following the tense situation in November, countries both near and far have sought to make their stance known in an effort to fulfill personal political and/or economic goals. For example, frustrated with the country’s former president’s decision to vacate from an EU agreement, the EU quickly reacted to Ukraine’s political instability by approving the provision of 1 billion euros of economic assistance to the new pro-Western Ukrainian government. Additionally, the EU issued tariff cuts to the country in order to make exporting goods to the EU cheaper and to reiterate why an economic partnership with the EU is worth pursuing. Furthermore, the United States, who just so happens to be a strong ally of the EU, has voiced its disapproval of pro-Russian Ukrainian factions by demanding the end of Russian participation and by the apparent orchestration of eastern Ukraine’s ongoing separatist violence. It has even gone so far as to continuously label Russia’s presence in the region as a carefully planned, “full-scale invasions,” causing a stark division between the US and Russia reminiscent of the Cold War. However bold, this language appears to be appropriate. After Russia’s occupation and annexation of Ukraine’s Black Sea peninsula of Crimea and its continued presence on the country’s eastern border, it is hardly surprising that a global power like the United States would distrust Russian actions and intentions. It is in the US’s political and economic interest, therefore, to protect Ukraine’s sovereignty and promote Ukraine becoming a member of the EU. Russia, however, views the situation differently. Because Ukraine and Georgia are the only territories separating Russia from NATO member-states (with the exception of the Russian port city of Kaliningrad), allowing Ukraine to join the EU and potentially join NATO is a scenario Russia cannot entertain. After all, NATO’s creation and ongoing expansion were centered around containing the Soviet Union politically and militarily. Understandably, Russia sees proximity to NATO as a direct threat to its national security, and therefore refuses to let Ukraine stray without a fight. That said, supporting a separatist movement is also not in Russia’s interest, for it will still lessen the physical divide between NATO members and Russia as a result of the incorporation of part of Ukraine into its borders, resulting in the expansion of Russia’s borders and the partial dissolving of its buffer from NATO. Russia, therefore, is walking a fine line; it must support pro-Russian Ukrainian factions without encouraging them to split away from Ukraine in order to create a new, united, pro-Russia Ukraine that Russia can depend on in its quest to maintain political security and distance from NATO. Until tensions are quelled within Ukraine and so long as Ukraine remains a global political, security, and economic interest, hostilities between the West and East will remain especially high. For such a small country, playing up its strategic value is the primary source of power it possesses. Consequently, maintaining ties with all parties best serves the country’s interests, and will likely mean a decision about whether or not to join the EU will be prolonged as long as the West permits. Only time will tell what Ukraine will do and which region will succeed most at wooing the fragile state. This week, Ukrainians began voting for a new parliament at a defining phase when trust in the current government is waning. Analysts have described this as an election highly dependent upon the gains of the opposition, but many Ukrainians are still pessimistic. Preliminary election results have already shown President Yanukovych’s ruling Party of Regions in the lead, with over 30% of the vote. Yulia Tymoshenko’s arrest is based on vague accusations alleging she abused her position as Prime Minister to make unfair gas deals with Russia, in addition to accusations regarding personal gains in her business in the 1990’s. European Union officials, as well as Russia, are frowning upon the arrest and political situation in Kiev as they express their disdain for President Yanukovych’s insincere political activities. Regardless of the upcoming results for Ukraine and Egypt, there are some parallels between both countries that point to obvious morals and shared experiences. Perhaps most crucial is the need for democracy to be built upon fundamental values, including a well-functioning judiciary, and for leaders and revolutionaries alike to pay attention to the importance of social welfare and the well being of citizens during a political transition. In both countries, power hungry leaders have emerged, while the declining political and economic conditions have swayed initial optimism and contributed to a drop in morale among citizens. 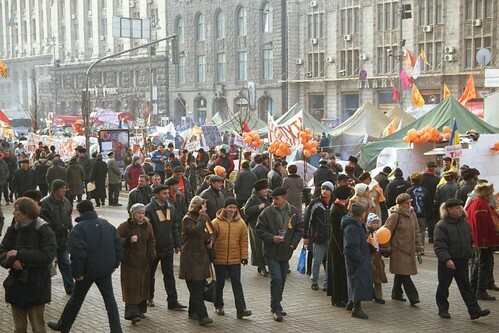 At the onset of the Egyptian Revolution, Ukrainians expressed the happiness they felt for Egyptians, but also, the need for them to refer to the experience of the Orange Revolution and its aftermath. In both countries, the coming period will be crucial in determining the success or failure of fundamental elements of the transitions. Laila Elimam is a first-year MPP student at the UCLA Luskin School of Public Affairs. She grew up in the Bay Area and studied and worked in Cairo for eight years before coming to UCLA. She is a co-editor with The Generation.